It was a stupendously boring night. I was within twenty minutes of escaping the radio station and ending my 2 pm to midnight shift. Usually when you hear the police and fire radios crackle to life with a possible story, you’re on edge until you get confirmation from the authorities saying there’s nothing to worry about, which was almost always the case. “News narrowly averted!” we’d say. News narrowly averted. Oh, but not this night. Within 60 seconds, the call went from a still-in-box with “some visible smoke” to a five-alarm inferno prompting frantic requests for specialty trucks, demolition crews, additional battalion chiefs, and extra ambulances. The overnight producer stabbed his pudgy index finger in my direction and croaked his orders. “Roll! I want a presence on this in the next 15 minutes!” Heart pumping, I grab my go bag, make sure I have my credentials, and head out into the unwelcoming dark, swearing every step of the way and knowing this night will likely not end well. By now, I’d covered so many fires that I could neatly tuck my anxiety tail between my legs, put on my “attitude-adjusted” public face, and tell the story of what I saw and heard with a smile in my voice. And it wasn’t easy because this one was a stabbing winter wind of a horror show. Black-tipped orange and yellow flames leaped into MeatCity’s sodium-light sky, silhouetting what remained of the last flophouse in this fashionable former slum. Fat, water-fed hoses crisscrossed the street from a half dozen fire plugs, each giving their full-throated power to the pumping trucks’ geysers. Worst of all was having to watch helplessly as the people caught up in this nightmare of heat and smoke became fodder for the 24-hour news cycle. The living chose to jump rather than wait for the flames. The anonymous dead were treated to an ignominy reserved for the underclasses: the woman who cleans the offices at night; the delivery man, or the impoverished widower. They didn’t matter to city officials or to the giant metal claws grabbing at sections of the falling, partially-extinguished husk. Toilets, bathtubs, mattresses, and someone’s legs dangled callously, indiscriminately from the beast’s teeth. I wanted to look away; to erase what I’d seen falling to the ground along with the charred bricks and poor man’s detritus. But I had a job to do, so I went on the air in my usual “as-it’s-happening” style, avoiding any direct mention of burned corpses. No one needs that unbidden needle to the brain. 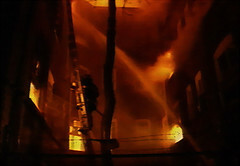 As black smoke turned pale, ghostly white, a MeatCity Fire Department spokesman tried to quash rumors that the powerful consortium that owned most of the area’s property (as well as several MeatCity committeemen) was at the root of this tragedy of poverty. Some of the affluent robe-and-pajama looky-loos crowed that GentriCon had finally wiped out the last remnants of blight marring their glass houses. Not directly, mind you. GentriCon would never do their own dirty work. A pad-locked exit door, iron-barred windows on the lower floors, and a few in-pocket electrical inspectors logging non-existent visits made it easy to blame careless residents smoking in beds next to cheap space heaters for this burning midnight caller. That was the party line and, although I might have believed otherwise, I dully reported the conclusion that the cause of MeatCity’s largest fire in 50 years was the fault of the dead and dispossessed. I filed a couple of sound bites and waited for the 5 am guy to greet the morning listeners with the sanitized mop-up of the overnight sensation. In the revistionist version, GentriCon and MeatCity officials were the heroes, having limited further loss of life and providing temporary shelter and warm clothing to those fortunate few. “There but for the grace of GentriCon…” is how his report began. I had to repeatedly swallow the bile rising up in my mouth. I dropped my bag – and my clothes stinking of soot and damp – just inside the front door. After a good scrub and two cold beers, I collapsed into a fitful sleep, emotionally exhausted. This time as I dreamed, a little girl watched me from the red brick apartment building across the courtyard. She was about my age, I think. She neither cried nor shrank back as my fiery end approached. It was her wordless calm that stilled the anxiety within and left me, once again, to accept my deadly fate. Previous Previous post: Don’t throw those strawberries out!